When an insurance adjuster is taking statements, he is just doing the standard thing require for him by his job. What is also part of his or her job is ensuring that the claim is investigated thoroughly to ensure that the insurance company does not pay anything that it does not have to. In both signed and recorded statements, an insurance adjuster will ask questions and record facts in a critical way, and may even engage in some tricks to ensure that his or her company is not held liable. Your New Jersey personal injury lawyer can advise you as to how to avoid said tricks. While actually just taking a statement is not in and of itself some kind of trick, it is not as innocent a practice as you might think. Insurance adjusters are paid to gather the facts of a case and investigate the claim. Obtaining statements from all the parties involved in an accident is one of the ways that they do so. The adjuster hopes to make a careful judgment on liability based on the facts as well as the statements from the involved parties and witnesses. They will decide to pay a claim, negotiate a compromise settlement, or deny a claim due to lack of liability. There are three types of statements that an adjuster can try to get: a signed statement, a recorded statement, or an interview. Signed statements must be generated in a relatively time-consuming in-person meeting, so the expense and time required to travel to a claimant factor into its costs. On the other hand, recorded statements can be taken more quickly in person or can even be done by phone, thus eliminating travel cost. Because of the push for more efficiency in insurance companies, many adjusters solely generate recorded rather than signed statements. When an insurance adjuster records a statement given by a claimant, it is called a recorded statement. This type of statement can be taken in person or by phone. Based on memory or notes, an adjuster will create a summary of the statement or, more rarely, send the tape to be transcribed. The same time that is needed to take a single signed statement can be used to get four or five recorded statements. Because of the increased efficiency of this method, it is preferred by most companies that their insurance adjusters take statements by phone rather than attempt signed statements in person. To find out how you should approach a statement, as well as other ways to avoid being tricked by insurance adjusters, get the legal help you need. 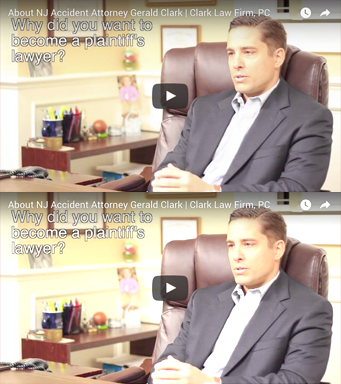 Call an experienced New Jersey personal injury attorney at the Clark Law Firm today to schedule an initial consultation.